October 30, 2014 In News What is Michelle doing now? Michelle delivered a Keynote speech at the Historic Hotels of America annual conference on the theme of “Consumers Crave Visual Stories: Increase the revenue from your hotel website with strong visuals.” Read more about the conference and her speech here. 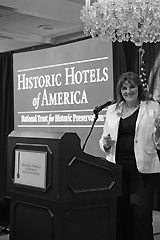 Michelle talking at the Historic Hotels of America speech. Lancaster county in Pennsylvania has America’s oldest Amish settlement. Thousands of Amish of Dutch/German origin live there following their traditional customs which have barely changed since the 19thcentury: simple living and working, without modern-day technology or machinery – farming the land with horse and trap, and using old-fashioned scooters for transport. A young Amish boy taking a rest. The Amish are an American Protestant group with about 200,000 members descended from European Anabaptists, who came to the USA more than two centuries ago to escape persecution. Related to Mennonites, they use their own dialect based on German, dress in plain attire, have their own education system, and eschew modern forms of communication and technology such as telephone, TV, radio, internet and even cameras; they don’t use electricity. The Amish way of life became known to millions around the world in the 1985 film Witness, starring Harrison Ford. 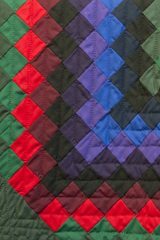 The Amish still preserve their handicrafts, such as quilting; the prices of quilts, however, are definitely modern-day, averaging around $1400 dollars for a handmade double bed-sized piece. They are beautiful and would definitely become a much-loved family heirloom in time to come. Visiting the Amish settlement in the autumn, Michelle saw pumpkins and gourds for sale everywhere. The landscape also included lots of corn fields. The villages have many antique stores and Michelle was able to purchase three photos to add to her “found photography” collection. 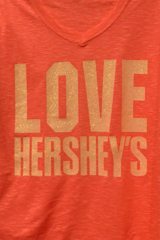 Hershey is the chocolate capital of the USA and Hershey’s bars, made by the town’s chocolate company, are sold in 60 countries worldwide. The company’s eponymous founder, Milton Hershey, was an avid traveller – this is a man who had a ticket on the Titanic and was annoyed when he had to change his dates! 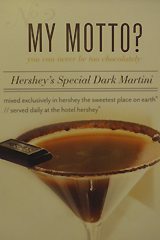 Milton travelled extensively around the Mediterranean and it is well documented that a postcard of a small 30-room hotel in Spain inspired him to build the magnificent Spanish-style Hotel Hershey, which opened its doors to the public in 1933. The hotel has twin towers, a Spanish patio with grand fountain, tiled floors, and an Iberian Lounge. Hotel Hershey in Pennsylvania, USA. Milton Hershey was a fascinating man: he and his wife Catherine were entrepreneurial philanthropists, and even today, the Milton Hershey school, founded in 1909 on the farm where Milton lived with his Mennonite family, provides free education and board for disadvantaged children. Unable to have children of their own, they believed that all children deserve the very best education regardless of their financial circumstances: “A family’s income should not determine a child’s outcome.” Alumni of the school include a Pulitzer Prize-winning journalist. 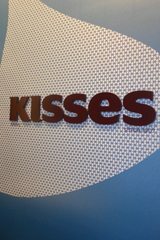 Hershey is known as “the sweetest place on earth” – and with funfairs and state-of-the-art chocolate factories, where visitors can create their own chocolate bar and packaging, you just have to agree. This whole town thrives on Milton Hershey’s success. Lindsey Ueberroth, President and CEO of Preferred Hotel Group, was in the audience at the HHA conference in Hershey, and Michelle was honoured that Lindsay invited Michelle to speak at the 2014 Preferred Hotel Group Global Conference in November. Michelle will deliver a keynote speech at the PHG Global Conference taking place in Pebble Beach, California, on 3-7 November, other keynote speakers include, Arianna Huffington of the Huffington Post, and Terry Jones, founder and former CEO of Travelocity.com, Chairman of Kayak.com, and CIO of Sabre. Finca Cortesin is an outstanding independent luxury hotel in Andalucia – in other words, it’s not part of a group or chain of hotels. Those who run the hotel are so-called “early adopters” and always try to be ahead of the curve, so in that vein, Michelle approached them to try out a brand-new lighting technique that perhaps only a handful of hotel photographers in the world are working on right now. A ‘making of’ collage of the project at Finca Cortesin. It´s a combination of painting with light, dusk shots, time-lapse, studio light and strobist techniques, and a lot of patience! A crew of four worked at Finca Cortesin on three consecutive nights with the aim of mastering this brand new technique. More news coming soon. Michelle spoke to renowned French brand consultant Jean Marc about luxury hotels and the important of quality photography when they met at Foro La Zagaleta luxury brand conference in Marbella last June. You can see the interview here. Michelle getting ready for her speech at hotel Hershey. 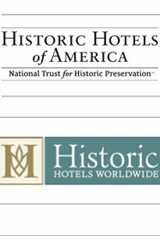 Historic Hotels of America logos. 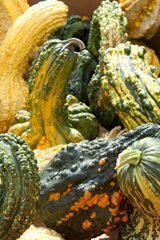 Pumpkins and gourds for sale on Amish farms.